Venomous snakes have a bad reputation—and rightly so—because of their often deadly bites. But what makes a snake’s bite so deadly—the venom—is the same thing that makes these snakes so valuable to the medical research community. Scientists have discovered that the very compounds that make venoms work may also prove useful in the treatment of several human disorders and diseases. Of the 3000 snake species, just over 600 are venomous. 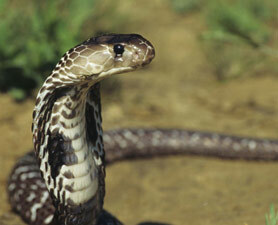 Snake venoms are made up of hundreds of different types of peptides, enzymes, and toxins. Each individual snake produces its own specific venom. Venom composition can vary within a single species and may also vary between life stages. For example, the venom produced by a juvenile snake may be much different than the venom it makes as an adult. There are two main types of venom—hemotoxins and neurotoxins. Hemotoxins target the circulatory system. They prevent clotting compounds from functioning correctly, which causes uncontrollable bleeding. Neurotoxins target the central nervous system. They stop muscles from working, which leads to suffocation. Venoms that are composed of neurotoxins are particularly deadly, as the proteins within them are able to disrupt the channels that allow ions to flow across neuron membranes. When these communication channels are disrupted, entire body systems can crash, leading to immediate death. Medicines derived from hemotoxins are used to treat heart attacks and blood disorders. The very first drug derived from snake venom toxin was developed to treat high blood pressure. This venom—taken from a Brazilian pit viper—contains a protein that prevents a compound called angiotensin-converting enzyme (ACE) from functioning correctly. The human body uses this enzyme to maintain a stable blood pressure. In the 1970s, medical researchers developed a synthetic version of the snake venom protein and used it in medicines that treat high blood pressure, which are called ACE inhibitors. In addition to having few side effects, use of these drugs also leads to decreased incidence of stroke, kidney disease, heart failure, and diabetes. Other drugs derived from hemotoxins include eptifibatide, which contains a modified rattlesnake venom protein, and tirofiban, which contains a venom protein from the African saw-scaled viper. Both of these medicines are used as a treatment for minor heart attacks and/or severe chest pain. These medicines work by helping to dissolve (and/or prevent the formation of) blood clots. Testing is currently underway for the treatment of stroke with a venom protein taken from the Malayan pit viper. So far, medical trials indicate that small dosages of the venom help to dissolve stroke-related blood clots and prevent new clots from forming. Medicines derived from neurotoxins are used to treat brain injuries, strokes, and diseases such as Alzheimer’s and Parkinson’s. Researchers at the Universidad Central del Cariba in Puerto Rico are studying venom proteins from the African mamba snake, one of the most poisonous snakes in the world. The scientists are most interested in learning how the venom proteins are able to latch on so tightly to both nerve cell receptors and receptors found on the surface of the brain. The nerve cell receptors are typically used to pass signals to neighboring muscles; the brain surface receptors are typically used to receive chemical signals that allow for learning, forming memories, and perceiving pain. Understanding the connection between the snake venom proteins and these particular receptors could have a profound impact on the development of new treatments for diseases such as Parkinson’s, Alzheimer’s, and various pain disorders. In addition to their effectiveness as a treatment for circulatory system disorders, researchers are also studying the potential for snake venom proteins to be used in the fight against cancer. Researchers in Australia have found that a compound in the venom of a certain type of snake (which the researchers have not yet publicly identified) can disrupt the function of endothelial cells that line the inner surface of blood vessels. This disruption causes the cells to separate from one another, which leads to their death and, thus, disrupts blood vessel function. Scientists think that this property could be exploited–meaning that the snake venom toxin could be used to disrupt the flow of blood to a tumor, preventing its growth. Because the venom toxins only act on certain types of cells, healthy cells would not be affected. Scientists are also studying snake venom as a potential source of painkilling compounds. Researchers in France have determined that two molecules isolated from black mamba venom (referred to as mambalgin-1 and mambalgin-2) are as effective as morphine in the elimination of pain. Much remains to be studied before a black mamba venom–derived drug could be considered for human use, but early test results using lab mice are encouraging. British researchers recently discovered that snake venom can evolve back into harmless molecules. According to Dr. Nicholas Casewell, who conducted the research at Liverpool School of Tropical Medicine, a snake’s venom gland is a “melting pot for evolving new functions for molecules.” While some of these molecules stay within the gland, others move to different parts of the body, where they serve different functions. These former venom proteins are called “bioactive proteins,” and are so-named for their ability to target specific metabolic processes. Casewell and other researchers think that these bioactive proteins could—and should—be screened for their potential medicinal use.